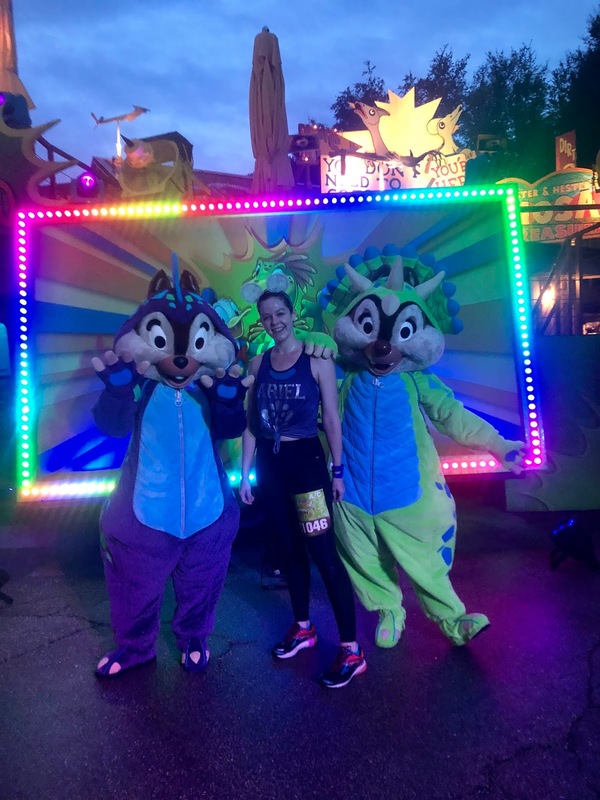 And now for my very favorite runDisney half marathon! Despite my standard issue paranoia and compounding exhaustion, I woke right up with my alarm for the Wine & Dine Half Marathon. Once again my phone tried to fake me out by not reflecting the time change, but this time I knew to simply restart it and there it was: 2:15am. Perfect. I taped up and dressed before rousing Erika, and once she was ready we headed out to the bus line and hopped on the second one out. We were deposited in the same Magic Kingdom bus stop as yesterday's 10K, which was a little weird for me as I was still sort of expecting the start at the ESPN Wide World of Sports as per years past. My brain is all sorts of nostalgic. 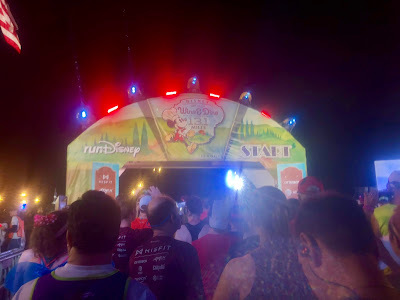 We were let into the corral area around 4:15am, and after a quick porta potty stop we went our separate ways - Erika off to corral G and me to corral C. The DJ started up shortly after and went through just about the exact same routine as pre-10K, with dancing and singing. His observations are absolutely correct: the back corrals are way more into it than the front corrals. Most of us in C just kinda sat there. In my defense I was pretty tired - mostly I was just looking forward to taking a shower after. Also my knee was worrying me. I had it good and KT-Taped up, but what if it failed and I had to hobble the whole way? ANXIETY. So my morale was not as high as it should be for a runDisney race. But that was okay. In my heart I knew the Disney magic would turn it around. Or if nothing else I was definitely going to get that hot shower. The first few corrals took off without any of the internal mini-waves, bringing C up to the front with a quickness. The usual fanfare and fireworks, and we were off! Initially my knee felt... okay. I was undoubtedly aware of it, maybe even fielding some complaints, but nothing so bad that it required I slow down or change my gait. I kept it slow and easy with the hope that a gentle pace would maintain the status quo. The first character stop was about a mile in, the green, yellow, and purple lights indicating the Mardi Gras theme of The Princess & The Frog. I've only seen this movie once, but I know Louis the gator when I see him and I thought frequent knee resting would be a good idea, so I jumped in the photo line. When I started up again 2-3 minutes later... MY KNEE DIDN'T HURT! At all! Oh Disney, what miracles thou hath wrought!!! I ran on with newly cheerful vigor. Sooner than I expected we were entering the Animal Kingdom, although from the side instead of the main entrance I remembered from years past. I guess this was to accommodate running through Pandora, which was... fine. I dunno, guys. I just can't get into it. Like, it's a weird forest that glows a little? Some of the rocks float? So I didn't get a ton out of running through that area. 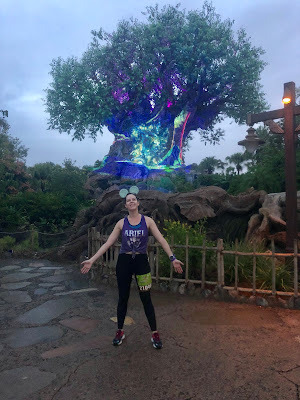 But I was very pleased to see the Awakenings show playing on the Tree of Life! 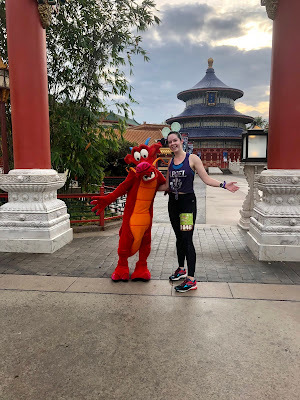 I was sad to see that the course nixed running past Everest, cutting us off just short as we were siphoned into Dinoland. It was there I stopped for a photo op with Chip and Dale. Normally I begrudge them their mean treatment of Pluto, but their dinosaur costumes were just too cute to pass up. I even made a friend in line! 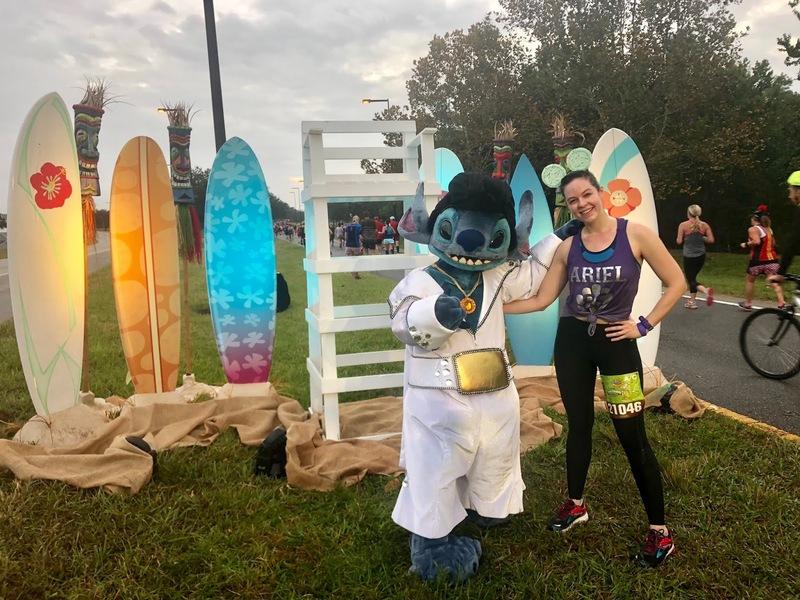 I saw the surfboards of Lilo & Stitch rising out of the ground for a photo stop and resolved to skip it; I had gotten them in previous races. But when I saw it was Elvis Stitch, obviously I had get in line! A couple miles later and we were running into the Hollywood Studios, which pleased me as the last time I ran the race construction forced us to bypass that park entirely. 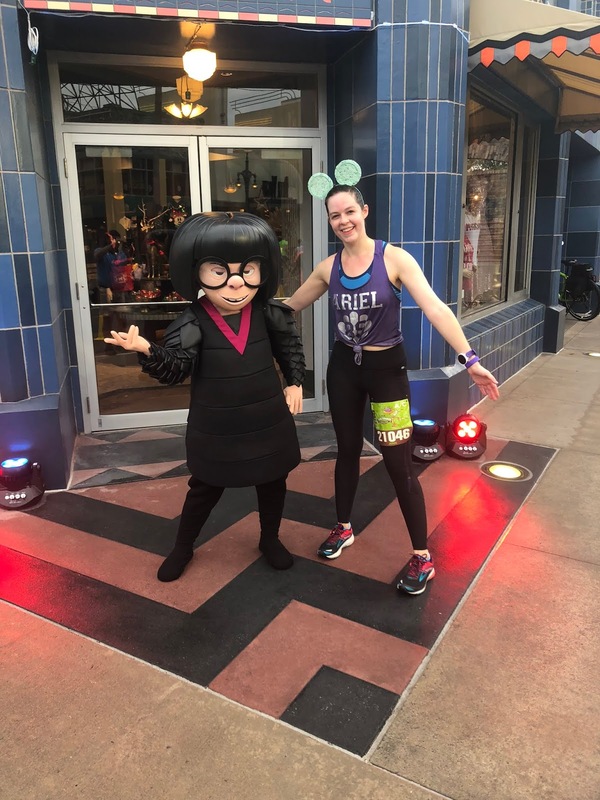 As I ran down Sunset Boulevard I was astonished to see Edna Mode had no line to speak of, so I stopped for a weird-arm-pose photo (I'm gonna have to redo this one given a chance). Next we rolled on out of DHS and onto the labyrinthine path toward the Boardwalk,which was surrounded by construction walls. They were livened up with some joke signs, but I can't remember any of them now so they can't have been that good. As per usual the spectators began showing up in force on the Boardwalk path proper, and the increasing roar of cheering pushed us all into Epcot. The delightful "Les Poissons" from The Little Mermaid was playing as I took my first steps toward France, which felt magnificently apropos. I stopped for a quick photo with Marie and sped off just in time to sing "Hee hee hee! HOH HOH HOH!!!!" with my man Rene Auburjonois, as is right and proper. 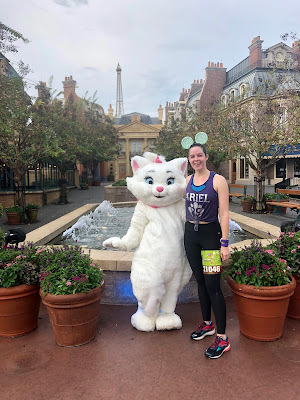 I was feelin' the runner's high right on time (World Showcase = dopamine for me for some reason), and I sped through the countries waving to all the WS cast members as they roared their approval. 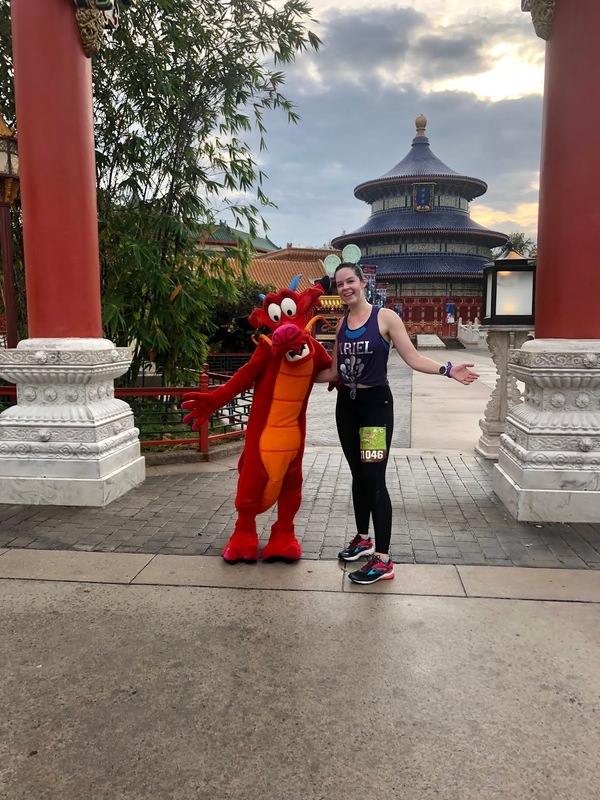 And I had to stop for a photo with the powerful, the pleasurable, the indestructible Mushu. And that was pretty much game! 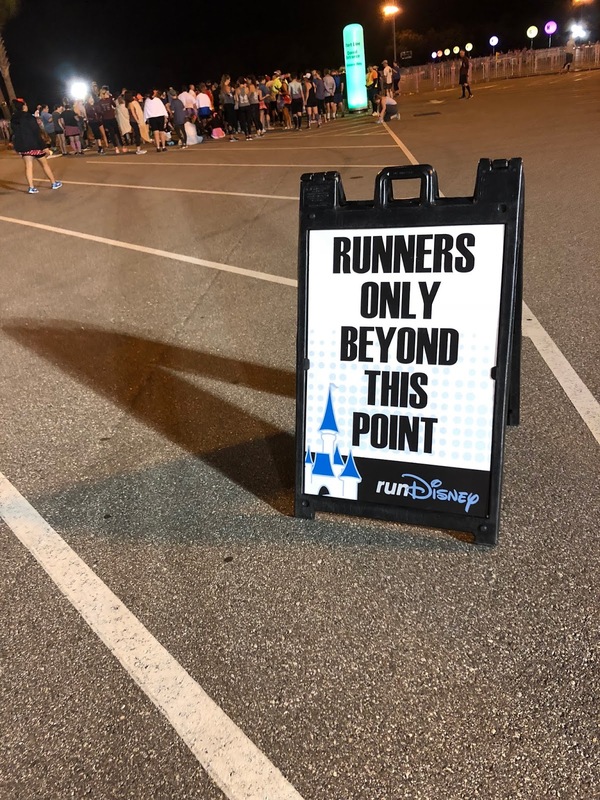 I went whooshing out of WS, into Future World, past Spaceship Earth, around the penultimate marching band at mile 13, and then bam: finish line. Unofficial time of 2:18:11, which isn't bad for one week post-marathon and one day post-10K with a bum knee and 8 photo stops. Negative splits FTW! I collected my medals (half and Two Course Challenge), grabbed some drinks and a snack box... and kinda looked around. Does anyone else kinda of have a, I don't know, lost feeling right after finishing a race? What am I supposed to do with myself now??? Luckily autopilot took over. I headed over to the merch tent on the extreme off chance that one hoodie I like suddenly showed up in small (it didn't) and get a bag for all my snacks and crud. 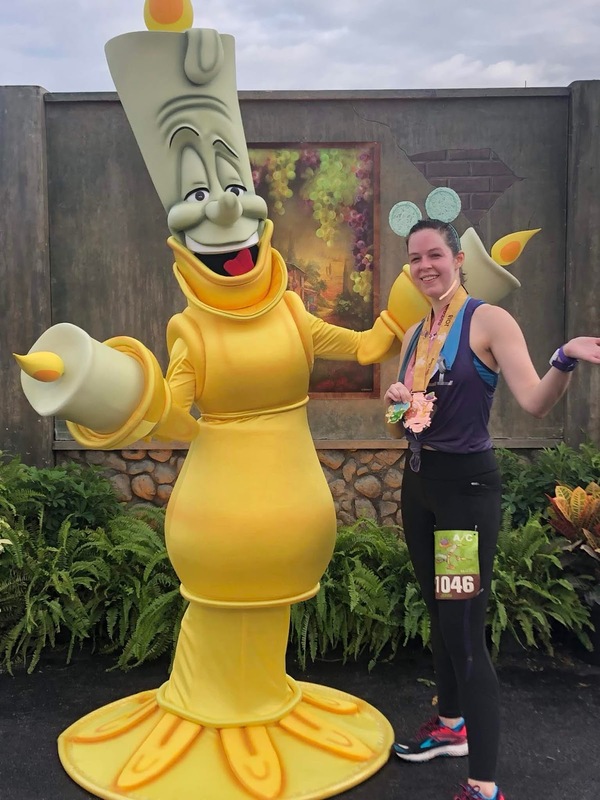 And then on a whim I took a picture with Lumiere, whose line was about 12,000 people shorter than it had been that morning. And that was pretty much that. I boarded a bus back to Pop, sulking over the lack of Oreos in the snack box, but at least certain that that shower was finally in my sights. TL;DR: I LOVE RUNDISNEY!!!! Is it marathon time yet??? Next up: A very long nap and the race after-party!